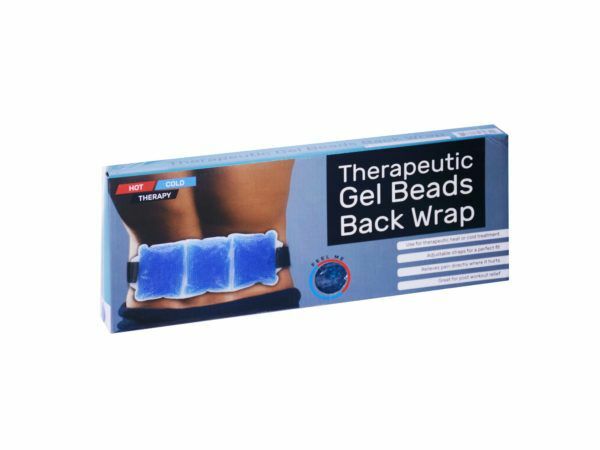 Great for hot and cold therapy, this Therapeutic Gel Beads Back Wrap features a comfortable design with a soft plastic gel bead-filled section and adjustable straps for a perfect fit. Wrap can be beneficial for post workout relief to help relieve pain directly where it hurts. Simply heat in a microwave for hot usage or place in a refrigerator for cold usage. Directions for use are printed on back of package. Measures approximately 37.5 long with a 12.5 x 5.125 gel bead section. Comes packaged in an individual box. Box measures approximately 13.5 x 1.5 x 5.5.